"My daughter and I had fun experimenting in the kitchen one night creating our own recipe." Mix sugar, butter, egg, and vanilla together in a large bowl. Mix flour, cocoa, baking soda, and salt in a small bowl. Beat flour mixture into sugar mixture slowly until well-combined, about 2 minutes. Stir chocolate chips into cookie dough. Spoon cookie dough onto the baking sheet, spaced about 2-inches apart. Bake in the preheated oven until edges are crisp, 10 to 12 minutes. Cool on the baking sheet for 5 minutes before transferring to a wire rack to cool completely. I made the recipe exactly as stated and they are just ok. Three people in my family and none of us were overly impressed. 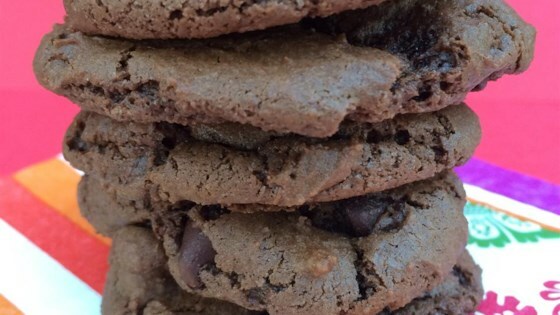 This is one of the best cookie recipes I've found on the site. Very chocolatey and delicious! Easy to make, and taste great. Might use white chocolate chips next time for some visual flair. Double this recipe. A single batch is not big enough. These were a big hit with my kids and their friends!